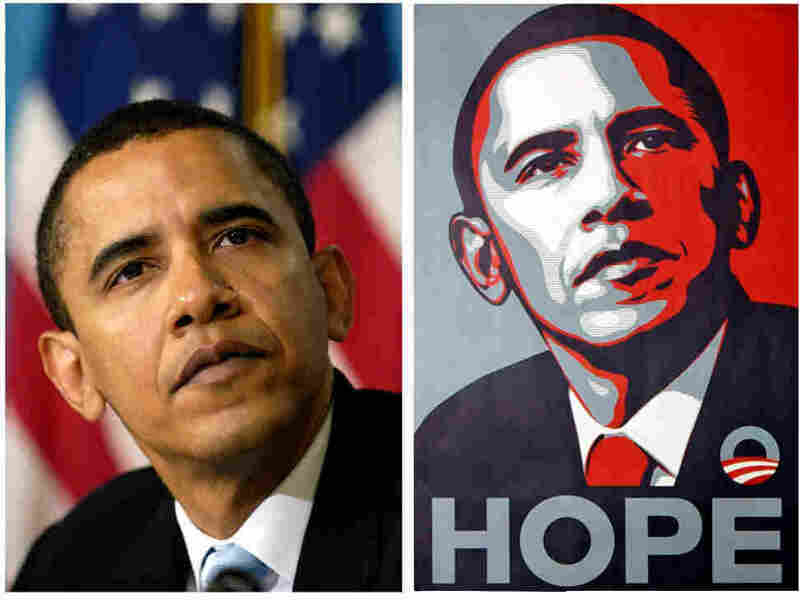 Shepard Fairey And AP Settle Copyright Dispute Over 'Hope' Poster : The Two-Way Neither side has budged on its view of the law, but they've agreed to work together and share the rights to make posters and merchandise based on the iconic poster. The AP photo, left, and the Shepard Fairey poster. Saying that "neither side surrenders its view of the law," the Associated Press nonetheless writes that there's been a settlement in its copyright infringement lawsuit against artist Shephard Fairey over his "Hope" poster that took on iconic status during the 2008 presidential campaign. "Mr. Fairey has agreed that he will not use another AP photo in his work without obtaining a license from the AP. The two sides have also agreed to work together going forward with the Hope image and share the rights to make the posters and merchandise bearing the Hope image and to collaborate on a series of images that Fairey will create based on AP photographs. The parties have agreed to additional financial terms that will remain confidential." The dispute arose, as Frank wrote back in October 2009, after it became clear that the image Fairey used of then-Sen. Barack Obama was drawn from a photograph taken by Mannie Garcia for the AP. At first, Fairey tried to deny he'd been inspired by that photo. Later, he argued that "fair use" allowed him to take the image and reinterpret it for artistic purposes. Update at 11:45 a.m. ET: Earlier, we said Garcia was a freelancer at the time the photo was taken. But the AP tells us he was on its staff when he took the picture.